I’m so happy that I’m living in an age where wearing a shirt with a massive cat on it is totally socially embraced. While my weekend wardrobe has its fair share of tanks and tees featuring some of my fave animals (foxes, dogs, kittens and the like), my workout wardrobe is seriously lacking in cuteness. As I begin training for my second half-marathon, I thought it’d be appropriate to expand upon my boring repertoire of boring tech shirts with some fun and inspirational shirts that I’ll get excited to sport on my daily runs. Check out some of my favorites below, and let me know if there are any other sweet shirts that I MUST buy. This entry was posted in Running/Fitness and tagged fashion, Fitness, geeky, half marathon, run, running, workout, workout clothes, workout gear, workout inspiration on May 18, 2014 by Melissa @ Nourished & Vibrant. 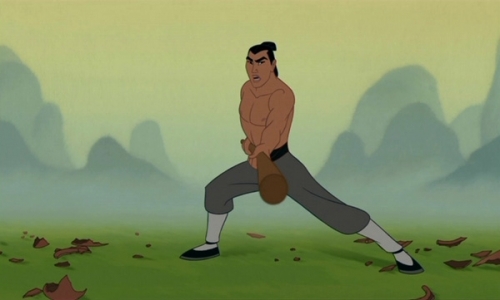 Every girl has crushed over her favorite Disney prince and has an opinion on the most beautiful princess, but I’ve never heard anyone discuss who would place first in a triathlon or outlift Beast. Pretty faces aside, here is my list of the top five most fit Disney characters and musings on how they achieve their inspiring physiques. Sure, Gaston knows how to handle his blunderbuss, but no man gets that ripped just by holding a gun. That physique has to be the result of a diehard crossfit regimen. Gaston must spend hours in his local box, killing his burpees and perfecting his clean and jerk. (You saw him effortlessly pick up that bench with three bimbettes sitting on it, right?) Plus, the man eats five dozen eggs each day, exemplifying his dedication to the paleo diet. With hips that don’t lie and the shimmy to drive any man out of his belltower, Esmeralda was born to dance. Fusing salsa, hip-hop and more, Zumba is likely her go-to workout that allows her to unleash her free-spirited and sultry self while getting a great cardio sesh in. Jumping from building to building while defying all the rules, this agile street rat knows just how to run, climb, swing and jump from place to place in order to escape danger or punishment. 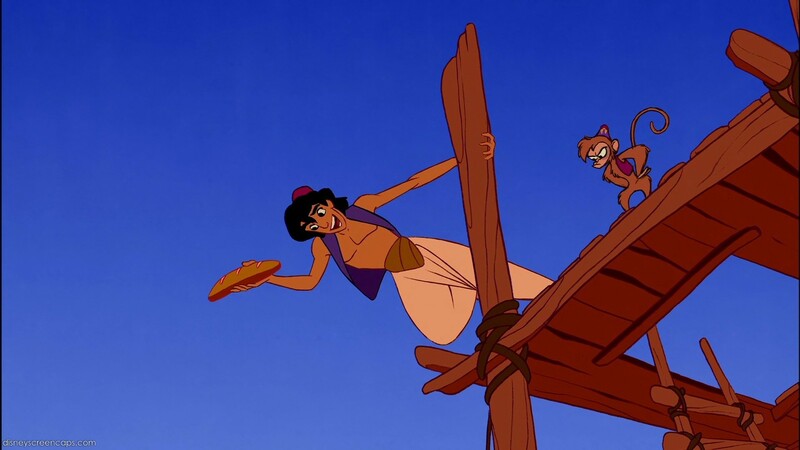 A true parkour athlete (with the abs to prove it), Aladdin understands that there’s a whole new (exciting and obstacle-filled) world out there if you think beyond the treadmill. Yeah, she knows how to paint with all the colors of the wind, but this fit beauty is so much more than an artist. The girl can move. She runs the land gracefully and effortlessly, as swift as a gazelle, without the need for footwear. Captain for the Chinese Army in Mulan, this “pretty boy” is a martial arts maven, whipping a crew of wannabe fighters into serious shape as he teaches them combat techniques that require punching, kicking, stick fighting, archery and more. Boasting physical strength, agility and discipline, he has the abilities and physique of a true warrior. Who makes your list of most fit Disney characters? This entry was posted in Health, Running/Fitness and tagged barefoot running, crossfit, disney, disney fitness, disney movies, Fitness, fitness inspiration, Health, humor, martial arts, parkour, top 5 list, walt disney, workout, zumba on May 6, 2014 by Melissa @ Nourished & Vibrant. Fact: I get really emotional at the start line of a race. Looking around at people of all ages, sizes and backgrounds, coming together to run one unified course and do so to (usually) support a good cause is a mesmerizing display. In my opinion, it’s the utmost proactive statement of community and dedication to well-being. For whatever reason you began running, whether it’s to get in shape for summer, prevent disease or just prove to yourself that you can, most people, myself included, began running with relatively self-centered motives. Leave it to race day to put you back in place and remove the focus from yourself. When you’re standing in a crowd of thousands of people at a start line, all ready to run the exact same course as you, it registers that, while this whole time you’ve been acting and thinking for yourself – reaching for PRs and scheduling “you time” to train on a regular basis – every other person out there is striving to achieve the exact same goal as you: make it across the finish line. As you’re waiting for the race to start, everyone’s adrenaline and energy intertwines and magnifies, and the energy becomes infectious. Massive speakers blast pump-up music, large groups in matching outfits cheer and whoop and onlookers congregate to cheer you on as you run down the streets, holding hand-written signs with encouraging words. You look around and see the variation in the group. Young and old run side by side. Runners for decades prepare to race down the same course as someone running her first race ever. Couples, families, solo runners and packs of friends have all came here, ready to accomplish the same thing as you. At this moment, you realize that you’re a part of something bigger than yourself. You’re a tiny moving cog in this massive world. You realize that while you’ve always seen your efforts, your training struggles, your victories – both in and outside of your running routine – as more important than anything else, there are countless others struggling with, reaching for and achieving the exact same things you are. Seeing streams of people who have decided to push themselves, train for weeks, begin to transform their entire state of health or, at the very least, show up really early on a weekend morning, is a moving and powerful display of human strength and capability that I hope everyone can experience at least once during their life. Seeing so many people come together, all with varying motives, but all with the shared end goal of crossing the same finish line, is phenomenal to think about. Yes, the actual race can be exhausting and painful, both mentally and physically. You may curse the day you decided to sign up for it and, with every atom in your body, want to stop halfway through, give up and call a cab. But whether you dash across the finish line with a 5 minute mile or practically slither your body over it, you’ve made it, along with everyone else and participated in something larger than yourself. This entry was posted in Health, Running/Fitness and tagged exercise, Health, race, running, running inspiration, why i love running on March 3, 2014 by Melissa @ Nourished & Vibrant. It’s Wednesday. It’s gloomy outside. I’m struggling to get myself up and go for a run. And I’m mopey for a cup of hot Sightglass coffee. Yes, my first world problems are getting the best of me. Last weekend was a whole different story, though. It was filled with lots of fresh air, good memories and delicious food. My hopes are that by creating this post I can hopefully lift my mood a bit and re-focus my energy on better things like…(drumroll please)…running my longest distance ever on Saturday – 10 miles! I can’t express how big of an accomplishment this was for me. As someone who could never finish one mile without stopping to walk during my entire school career, running 10 miles straight (and feeling great afterward) is proof that, with a lot of work and mental dedication, you really can do just about anything. Seriously. But the daily fitness didn’t end there! I ended my run at AT&T Park, devoured a protein bar and banana, then drove across the city (sore legs and all) to hike Land’s End. I’ve never done the hike before, and haven’t spent much time at that end of the city, but am happy I could experience the walk/hike on such a beautiful, cloudless day. The beach + sunshine + fitness = a glorious afternoon. I threw in an Italian sausage and sprinkled parmesan to top it all off. Ohmygosh, so good. Advice: If you’re going through your own case of Hump Day Tiredness, I recommend a big serving of anything covered in homemade pasta sauce. This entry was posted in Food, Running/Fitness and tagged Cooking, dinner, Food, hike, Land's End, meat sauce, pasta, pasta sauce, run, running inspiration, san francisco, weekend, zoodles, zucchini noodles on February 6, 2014 by Melissa @ Nourished & Vibrant. Now that I have an apartment of my own and the PG&E bill is lovingly addressed to yours truly, I’ve become somewhat of a heat Nazi. Following in my mother’s footsteps, the solution to a cold winter night is no longer cranking up the heater and happily lounging in pajama shorts and a tee. Rather, the new protocol includes suiting up in a big sweatshirt and thick socks and happily spending hours hovering over a warm stove and enjoying a hearty, hot meal. I came across Saveur’s Carbonnade (Flemish Beef & Beer Stew) recipe and knew I had to make it for a satisfying Sunday night meal. Note: cooking with meat and beer is always a good idea. Of course, I had to experiment with a gluten-free version, using almond flour to coat the beef and gluten-free beer…and I loved the result! Carbonnade is a Flemish beef and onion stew that, unlike many French stews, is braised in beer instead of wine. The beer makes the dish extremely rich, but apple cider vinegar and brown sugar add a sweet note and a slightly sour taste that, altogether, melt in your mouth and make you kind of excited it’s cold enough to enjoy a hot bowl of stew. I served the carbonnade over gluten-free fusilli, but it would be equally good served over polenta or along with roasted carrots. Season beef with salt and pepper in a bowl; add almond flour and toss to coat. Heat 2 tbsp. butter in a 6-qt. Dutch oven over medium-high heat. Working in batches, add beef; cook, turning, until browned, about 8 minutes. Transfer to a plate; set aside. Add bacon; cook until its fat renders, about 8 minutes. Add remaining butter, garlic, and onions; cook until caramelized, about 30 minutes. Add half the gluten-free beer; cook, scraping bottom of pot, until slightly reduced, about 4 minutes. Return beef to pot with remaining beer, stock, sugar, vinegar, thyme, parsley, tarragon, bay leaf, and salt and pepper; boil. Reduce heat to medium-low; cook, covered, until beef is tender, about 1 ½ hours. Serve over gluten-free pasta or accompanied by bread. This entry was posted in Recipes, Running/Fitness and tagged beef and beer stew, beef stew, beer, braised dish, carbonnade, comfort food, flemish stew, Food, Gluten-free, Recipe, stew, stew recipe, Winter on January 16, 2014 by Melissa @ Nourished & Vibrant. My excellent friend, Sarah – aka “Miss GoodbyeGluten” – is on the quest to eliminate gluten from her diet and improve herself by putting better quality foods into her system, working out daily and documenting her experience. I figured a great way to stay reminded to take care of myself would be to write a list of positive happy health “resolutions.” Gretchen Rubin does something similar in The Happiness Project and swears that declaring and revisiting her resolutions often is what helped her achieve personal change. 1. Move. As much as you can. 2. Love and respect what God has given you to work with. 4. Sweat is a beautiful thing. 5. Sunshine is a cure-all. 6. Lean protein, veggies & fruit…always. 7. Make time for yourself. 9. Stress less and practice patience. 10. Push yourself mentally so that you can go the extra mile physically. Wish me luck! Especially with #9…that’s my Boss Battle. This entry was posted in Health, Personal, Running/Fitness and tagged Fitness, Gluten-free, Happiness, Health on April 25, 2013 by Melissa @ Nourished & Vibrant. Enter your email address to follow What She Makes and receive notifications of new posts by email. My name is Melissa, and I love to write, cook, and create. I am fueled by sunshine and black coffee, and I say yes to eating, running, and making things by hand. I try to fill my days with learning, making, moving, and cat cuddling, all of which are what life is all about, in my book.